I guess in its real original form it was on the outside of a sheep and a goat, so even those two big puffs of fiber are compact in relative terms. 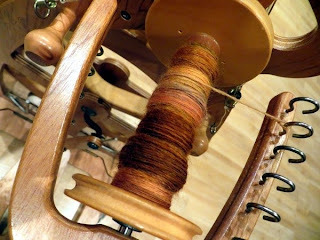 Every year I've done the Tour I have made huge leaps forward in my spinning skills. This year I hoped to learn how to spin consistently enough to make socks from my own handspun, and I guess when I've plied these singles and done all the setup that goes with that, I'll know. 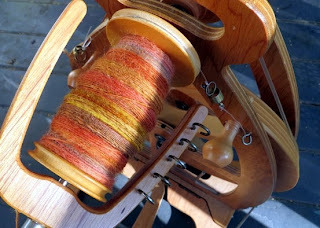 What I definitely did learn was how to spin very slim strands, compared to last year's bulky offerings. Another thing I learned was that sometimes I'm my own worst own enemy when it comes to setting goals. As in, sometimes it's not just okay to let go of a goal, it's a smart idea. There were a lot of nights on this particular Tour when the day was so busy, the only spinning I could get done was what happened after 10 or 11 at night. I should have just gone to bed and started the next day rested. There were also a lot of days when my right hand was sore from drawing out the fiber, no matter how much I pre-drafted it. 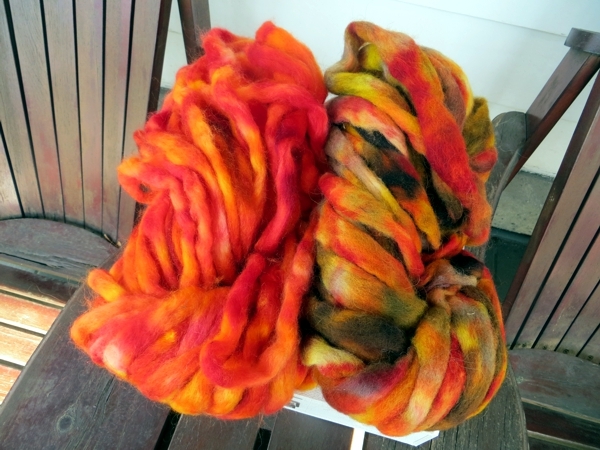 I should have taken more breaks, or switched for a bit to another fiber with less lanolin in it. Something like silk or bamboo that doesn't have the same stick factor. 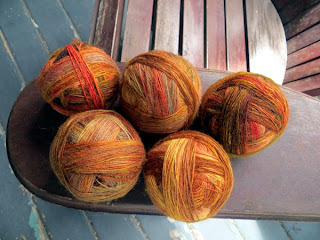 But no: I wanted to get through all three remaining giant lumps of Stoddart roving, and so I pushed myself. 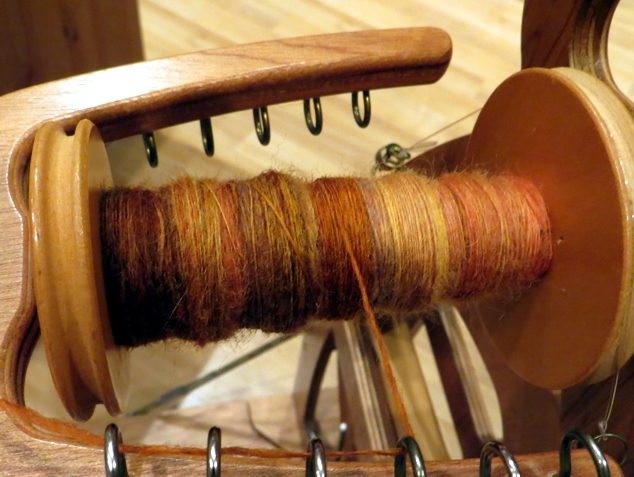 It's not such bad news - I only have one more lump left, and it's already divided into three, so it's kind of no-brainer spinning as long as I do rest my hand and don't work too late. The other thing I learned is that it takes a lot longer to spin fine singles than bulky ones. That should be obvious, since you're putting out more mileage, but it just didn't occur to me until I started feeling restless about why had I not gotten farther through the current bag o' fiber by now? To illustrate that point, here is what the last bag looked like over the final few days of the Tour. I stayed up past midnight so I could finish it and get it off the wheel, I was that desperate for closure. At the moment I have bid a fond but grateful farewell to my wheel for a while, even if 'a while' turns out to be nothing more than a few days because of that last lump hanging over my head. I have socks to knit, and another thing for the cottage that if I've chosen my yarn right should have some wow factor, and I still really want to cast on the hats I was thinking of last month as well as the new one I thought of this week. And also: more sewing! Which I hope to get to today. I love the colors!!! I personally would find it very hard to continue one project throughout the day. Especially if you are at the cottage, with the lake breezes, I'd be outside enjoying knitting and just being!! New hat designs?? Hmmmm that sounds wonderful!! I have never tried spinning-yet!